Satin Doll is a very well balanced villa; spotless, comfortable bedrooms, plenty of living space and a lovely, private front garden with sea views. 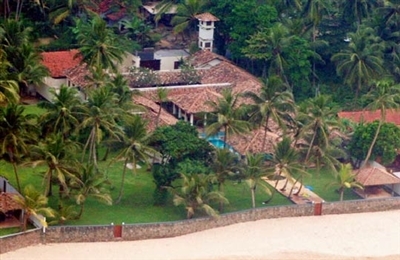 The villa’s manager Thushara was also extremely eager to please and dealt with any issues that arose, quickly and discreetly. The contemporary artwork scattered around the villa, including the potentially authentic ‘Rage – The Flower Thrower’ Banksy by the dining area (the owner has no clue who painted it!) – also caught our eye, as did the beautifully soft palm-motif Indian bedspreads and cushions that were handpicked by the owners. 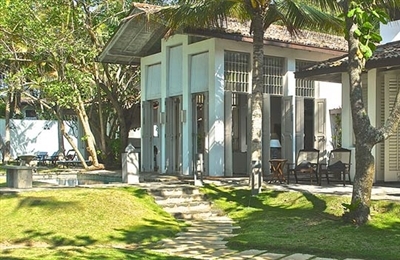 The villa has its own chef, and for lunch we ate gazpacho soup and tuna nicoise salad (our request; something light) and for dinner the staff prepared a house speciality, fish biryani, with brinjol pickle and salad. The suggestion menu was enticing, and included crispy pork belly, Thai curry, seafood options, and whole roast chicken. All food and drinks are charged at cost price (plus a 20% mark up), or you could opt to pay LKR 2,500 (around $20) per adult per meal (half price for kids). Breakfast is included in the rate. As soon as we crossed the serene lotus pond into the house, Victoria’s tranquillity was obvious. 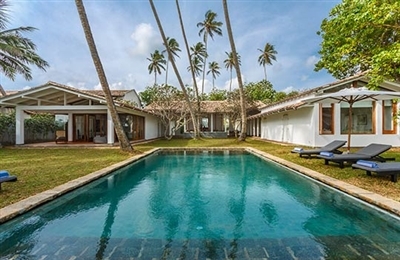 The villa was built to exhibit the character of a traditional Sri Lankan home and although only 15 years old, it is still quite a few years older than many of its neighbouring villas. However, we felt that its classical build, elegant decor and pretty palm-dotted lawn made it feel timeless, whilst up-to-date facilities – movie room, iPod docking station – combined with the vivid blue colour scheme added necessary contemporary touches. The experienced staff also added to the enjoyment of our stay. They went about their work discreetly and we were impressed by their attention to small details, such as remembering how we took our tea and which foods we did and didn’t like. The cook was very amenable and able to cook a wide variety of cuisines – from typical Sri Lankan meals to Thai and Chinese dishes – with ease. The food was not only good but economical and the kitchen is also very well equipped for self-caterers . Each of Victoria’s bedrooms offers plenty of comfort although there’s only one with direct sea views. None of the rooms in the house is air conditioned except for the TV Room, which made watching a movie much more comfortableThe pool in the garden is a real treat and although not especially big, it more than makes up for the lack of sea swimming possibilities just beyond the villa wall.